I had the opportunity last weekend to hear Jacob Prasch speak on topics related to the Passover season. One of his comments that I’ve been pondering had to do with the story we just looked at in Matthew 21:1-13. Judgement always beings in the house of God and with purifying the priesthood. God cares more right now about the sin in His peoples’ lives than about the sin in the world. This idea didn’t originate with Mr. Prasch. The Apostle Peter wrote, “for the time has come for judgement to begin with the household of God.” God’s judgement “begins first with us,” not with the world (1 Pet. 4:17-18). The world will have a time of judgement, for Yahweh of Armies says to the nations, “I begin to work evil at the city which is called by my name, and should you be utterly unpunished?” (Jer. 25:29, WEB). However, the final judgement on the nations will wait for Jesus’s second coming. The judgement on His people started with His first coming. 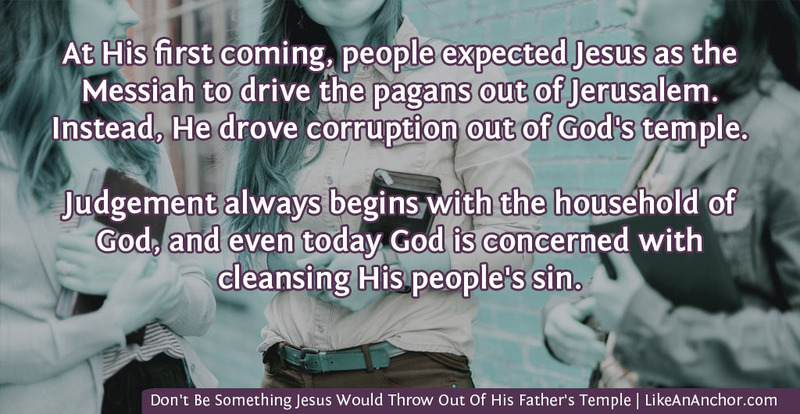 We don’t usually talk about judgement in relation to Jesus’ first coming. Our focus is usually on salvation, because we all know “God so loved the world, that he gave his one and only Son, that whoever believes in him should not perish, but have eternal life. For God didn’t send his Son into the world to judge the world, but that the world should be saved through him” (John 3:16-17, WEB). Christ didn’t come for the purpose of condemnation, but for salvation. He came to save His people from sin and open up salvation to the entire world, not to sort-out the whole world and render judgement on it. However, simply by coming as the Light of the world, Jesus made it very clear who was and was not following the ways of God. Those who rejected Him brought judgement on themselves by not believing in Jesus as the Messiah. They fled the light instead of coming to Him that their works might be corrected, tested, and proved before God. Refusing to listen to Jesus’ message, repent, and believe in Him as the Messiah resulted in people who thought they were following God getting thrown out of His temple and even cut out of His people (see Romans 11). I find it interesting that the letters the Apostles wrote, which are now part of the Bible, aren’t focused on evangelism. Unlike so many modern churches, the Apostles didn’t spend a whole lot of time telling believers to get out there and save the world. Their letters focused on urging those who already believe to keep walking faithfully. And if any of the readers aren’t yet walking in-step with Jesus, the Apostles told them to get their lives cleaned up right now. I’m not saying we shouldn’t preach the gospel. In fact, we must share our Father’s desire that all people will be saved, repent, and come to knowledge of the truth (1 Tim. 2:4; 2 Pet. 3:9). But scripture makes it very clear that God is ultimately the one who chooses whom to call and whether or not to place them in His family (John 6:44,65). We have very little role in that process. But we do have control over how we, personally, respond to the gift He offers us and over what we contribute to the body of Christ. When God does call new believers, He wants to be able to put them in a healthy church. Not one that’s full of the sort of people Jesus threw out of the temple. Today, the collective body of Christ’s followers are the temple of God. “If anyone destroys” (corrupts, spoils, depraves) “God’s temple, God will destroy him; for God’s temple is holy, which you are” (1 Cor. 3:16-17). God will not tolerate a temple filled with corruption and darkness. That truth should motivate us to make sure we’re not corrupting His temple in any way. Jesus said, “I have come as a light into the world, that whoever believes in me may not remain in the darkness.” He wasn’t here to judge those who don’t believe (they’ll be judged by His word in the last day), but to enlighten those who do believe and show them how to continue walking faithfully (John 12:46-48). For you were once darkness, but are now light in the Lord. Walk as children of light … Have no fellowship with the unfruitful deeds of darkness, but rather even reprove them. For the things which are done by them in secret, it is a shame even to speak of. But all things, when they are reproved, are revealed by the light, for everything that reveals is light. (Eph. 5:8, 11-13, WEB). 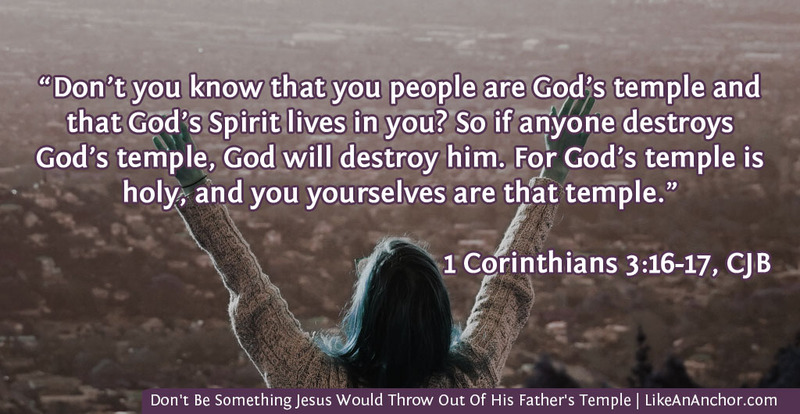 You can’t have fellowship with Jesus and keep doing the sorts of things He threw people out of His Father’s temple for, or any of the other things the Lord considers an abomination. “Haughty eyes, a lying tongue, hands that shed innocent blood; a heart that devises wicked schemes, feet that are swift in running to mischief, a false witness who utters lies, and he who sows discord among brothers” are things that will not be tolerated in the temple of God (Prov. 6:16-19). Those with an authentic, life-changing relationship with Jesus Christ keep coming back to the light. We’re not perfect, but we don’t love darkness. We choose to follow Him and walk in his light. And as we do that, the blood of Jesus continues cleansing us from all sin. Ideally, pointing each other toward Jesus Christ and encouraging each other to walk in the light will result in a healthy church. But there are times when more direct action is needed to protect the health of the body. 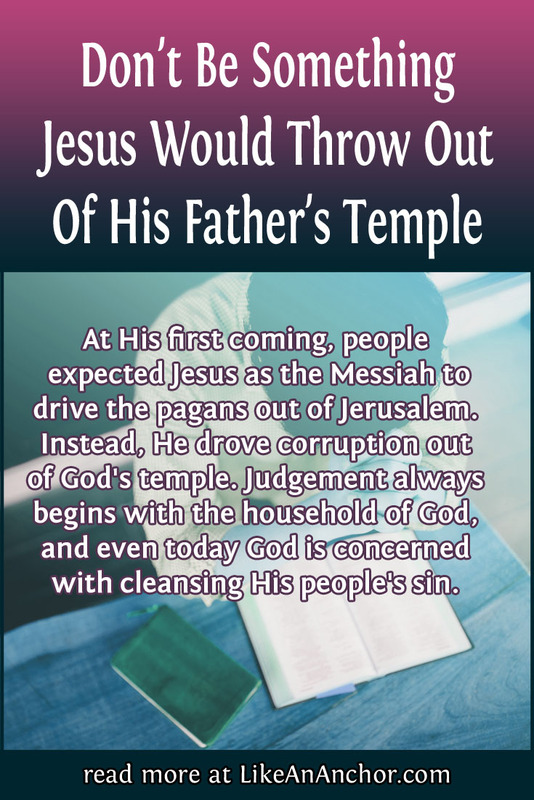 When something corrupts the temple of God or His royal priesthood (which we’re a part of), then He’s going to take action to cleanse His temple just as Christ did at His first coming. As we’ve already talked about, judgement begins at the household of God. And somewhat surprisingly, Paul says the church actually has a role to play in cleansing the temple. This is what we were talking about last week. In 1 Corinthians, Paul uses the symbolism of the Passover and the Feast of Unleavened Bread to tell us how important it is to God to have an “unleavened,” sinless church. The old leaven must be purged out. While we have no right to cast ultimate judgement on someone, we are supposed to be able to discern between good and evil. And when we see someone else in God’s family heading into darkness, we’re supposed to share correction with the intention of pointing them back to the light. We also have to be open to accepting correction if we’re the ones going the wrong direction. Judgement begins with the household of God in the temple that we’re a part of. Thankfully, God rejoices in showing mercy and He does not desire for anyone to come under condemnation. Jesus’ first coming brought light and hope to all people and we’ve now been invited to follow Him in a close, personal relationship. We don’t have to be something Jesus would throw out of His Father’s house. We can choose life by following the Light and letting Him make us part of His family. Very interesting. Gives me a completely new insight into this incident. He also rode in on THE day for choosing lambs–the 10th day of the 1st month. Thank you for your post. It’s so refreshing to find another voice who thinks about these things, too. I often wonder how Jesus would react if He walked into today’s churches, too. I’ve heard from a heartbreakingly high number of people who’ve suffered their most traumatic abuses at the hands of other church members, often ones in positions of authority. If I feel speechless/angry/heartbroken at the things I know about, what must God feel like looking down and seeing every way people have twisted His words and used His church to hurt others? I’d love for you to keep me updated on that book project you mentioned — I’m going to want to read it when you’re finished! I thought this post was a very profound message, one I could think on for some time, thank you.